is an artist run project space where artists, writers and curators can present their work in a one day or evening event. It could be a work still in the making or not exhibited before, and a chance to talk about it with other people there and then. occasionals will be presenting 3 projections by Ian Whittlesea. Each projection shows a series of names and is an attempt to list chronologically everyone an individual met in their lifetime. 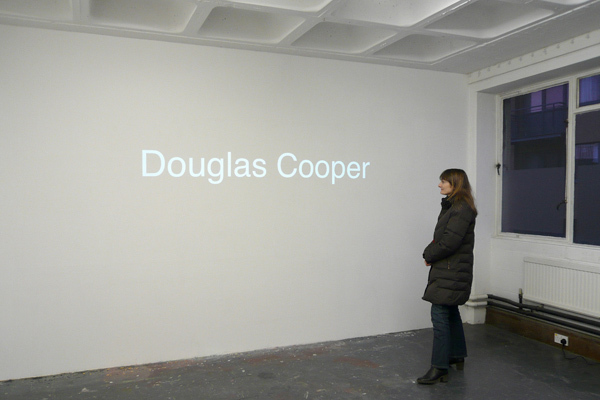 The names are projected as white text on a white wall in an illuminated space. Each name slowly appears and fades away to be replaced by the next. These are ongoing works, altered and added to over time as the artist acquires new biographical information about the subjects. There will be drinks and a short, informal discussion during the final projection from 6:26 - 8:00pm. 1 - 15 Cremer St.